Mark Twain wrote his most famous works in an octagonal study overlooking Elmira, NY, the hometown of his wife, Olivia. For more than two decades the Clemens family summered with Olivia’s siblings at Quarry Farm. All are buried at the nearby Woodlawn Cemetery. 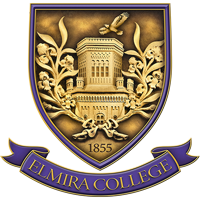 In 1983, both Quarry Farm and the study, since relocated to the Elmira College campus, became part of the Center for Mark Twain Studies. CMTS is dedicated to serving an international community of Twain Scholars.